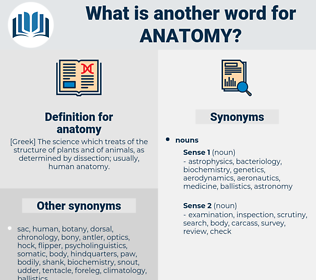 What is another word for anatomy? [ Greek] The science which treats of the structure of plants and of animals, as determined by dissection; usually, human anatomy. coalescence, amalgamation, assimilation, consolidation, conglomeration, agglomeration, synthesis, unification, integration, aggregation. The essentials, the vital spirits of Christianity are exhausted, and some dry bones, like an anatomy of a Christian, remain behind. With your knowledge of anatomy, I am sure you can practice and be successful, and should be in all cases over which Osteopathy is supposed to preside. ammunition, amaethon, anhedonia, amyotonia, antenna, antonym, anthem, animation, anthony, anatotitan, antum, anodyne, Anthony Wayne, anthidium, and then, antitauon, Antinomy, anathema, Anno Domini, amianthum, antimony, antedon, aminomethane, anethum, antimuon, andean, antinomian, annotation, antonymy, antony. microscopic anatomy, clinical anatomy, gross anatomy, regional anatomy, physiological anatomy, Osteology, developmental anatomy, morphophysiology, comparative anatomy, macroscopic anatomy, applied anatomy, topology, neuroanatomy, functional anatomy, topographic anatomy.